White Memorial Presbyterian Church has been sponsoring new Habitat for Humanity homes in Wake County since 1989. We have sponsored and been involved in building about 30 new homes, many in partnership with First Presbyterian Church in Raleigh. The scope of our involvement is not limited to sponsoring new home construction. We are also in involved with home improvement projects, wall builds and youth projects. 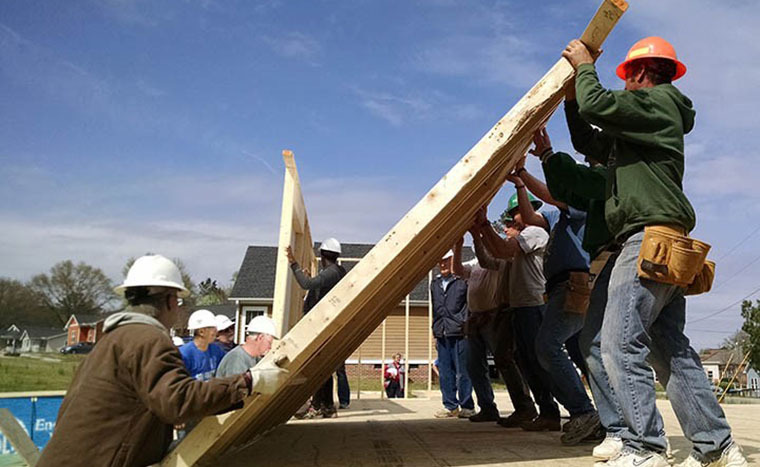 There are many opportunities for White Memorial members to serve their community by building and improving homes through Habitat for Humanity of Wake County. Information about upcoming projects can be found on the website, in bulletins and newsletters. Contact Harry Montgomery, the White Memorial Habitat coordinator, with questions or to be added to the church Habitat email list. You can also sign up for projects unique to White Memorial at http://vhub.at/whitememorial. White Memorial has been the lead sponsor for about 30 new home projects since 1989. We have sponsored more new homes for Habitat of Wake County than any other faith-based group. We currently are doing one new home a year. In 2017 we participated in the Interfaith Build. In 2018 we participated in the Presbyterian Build. In 2019 we will be the lead sponsor for the Fiesta Build. Home Improvement Projects began in 2010 as part of a new focus by Habitat called the Neighborhood Revitalization Initiative (NRI). A part of the NRI was a program called “A Brush with Kindness” which evolved into the Home Improvement Projects. Usually performed in neighborhoods where Habitat is building new homes, the goals are to raise the quality and value of existing housing and thus improve the overall perception of the neighborhood as a desirable place to live and to improve the safety and quality of the home. The homeowner for each improvement project must meet certain financial requirements. White Memorial completed three home improvement projects in 2017, one in 2018, and has two planned for 2019. Typically these projects are performed over two days on a Friday and Saturday. Our last three projects primarily involved siding replacement, roof replacement, and handicap ramp and deck construction. Painting, caulking, and yard work are frequent tasks on these projects. Wall builds take place at the Habitat construction facility at 2615 Westinghouse Blvd. behind the Web-Don building. During a wall build all of the walls (interior and exterior) are constructed. Lumber has been pre-cut and volunteers nail the pieces together to make the various wall sections which are then put on a trailer for transport to a build site. White Memorial is currently partnering with two other groups on our Habitat projects. For about eight years the men of Healing Transitions on Goode Street have been volunteering with us. Usually 3 to 6 men from this organization join us on our Saturday work days. The association has been mutually beneficial and enjoyed by all participants. Three years ago we also began partnering with Iglesia Santuario, a Hispanic fellowship preparing to become a Presbyterian congregation. We have sponsored and funded their Habitat participation. The camaraderie between Santuario and White Memorial has been exceptional. We worked together on the Interfaith Build in 2017, the Presbyterian Build in 2018, a couple of wall builds, and several home improvement projects. On Sunday February 10, 2019, Harry Montgomery presented Iglesia Santuario a Habitat plaque of appreciation for their participation in the recently completed Presbyterian Build. The presentation was made during their Sunday afternoon service at Trinity Presbyterian Church. In addition to partnering on Habitat Homes, White Memorial has been supporting Iglesia Santuario for the past three years as they work toward becoming a Presbyterian congregation. We completed our first Habitat home improvement project of the year on Saturday, March 28, 2019. The two day event proved to be one of our most successful projects to date. Five groups-White Memorial, Iglesia Santuario, Healing Transitions, a group of young ladies from NCSU, and Habitat leadership- came together to paint and refurbish the exterior of a 94-year old's home in south Raleigh. Led by Robin Bruce from Habitat, a small group prepped the house on Friday by performing minor repairs, caulking, and priming. On Saturday White Memorial members, Santuario members, friends from Healing Transitions and young women from NCSU joined to complete the project. There were twenty-one workers in all-easily one of our largest and most diverse groups yet for a home improvement project. This project was indeed what mission and outreach are all about: showing God’s love through service, building relationships, and sharing resources provided through God’s grace. Our next home improvement project is scheduled for June 7 and 8, 2019. All are welcome to join. The Fiesta Initiative is Habitat's new outreach initiative which focuses on involving the Wake Latino community in Habitat projects. Its goals are to translate and develop Spanish home buyer application materials, encourage Latinos/Hispanics to apply to the home ownership program, develop new programs directed toward Latino youth, and encourage Latino churches/ministries to participate in Fiesta Builds. Gloria Johnson and Harry Montgomery attended a kick-off event on February 21, 2019 which was attended by many prominent and influential members of the Latino community and members of churches that partner with Latino faith groups. White Memorial will be the lead sponsor for the first Fiesta Build in the fall of 2019, as we continue our commitment to be a strong supporter and catalyst for Habitat projects. Other area churches committed to the Fiesta Initiative include Iglesia Santuario, Fiesta Christina and Apex United Methodist Church (UMC), Knightdale UMC and their Latino ministry, First UMC Cary and their affiliated Latino church, and White Plains UMC and their Latino ministry. The Presbyterian Build, located at 820 Grove Creek Lane in the Crosstowne Subdivision was dedicated on February 2, 2019. Special thanks to Iglesia Santuario and Healing Transitions for their support and to the members of White Memorial who volunteered and provided lunches. Participating Presbyterian churches were Cornerstone, Davie Street, First, Kirk of Kildaire, Presbytery of New Hope, Presbyterian Campus Ministry, Iglesia Santuario, St. Giles, Trinity, West Raleigh and White Memorial.